There are many different WRAP program models. States, regions, agencies and organizations, and countries develop WRAP programs to meet their specific needs. The Copeland Center, the training organization for WRAP, provides technical assistance as these entities develop program models to assure that the program adheres to the WRAP Values and Ethics, and that it will meet the needs of the people being served. The reports included here are a sampling of these models. By BJ North, Advanced Level WRAP facilitator. BJ North became a WRAP Group facilitator in 1998, and became an Advanced level facilitator in 2003. BJ had a strong personal commitment to integrating WRAP into her region of California. The first thing I did was to find out what service agencies provided training and who the agencies were that provided those services.Then I researched what kind of training the agencies went to or brought to their staff. I did this by looking at their websites, visiting them at the various job sites and interviewing key people. I also asked people at these sites what kind of training they were interested in.I searched the Internet to find out about the kind of training they were attending and to see what was being offered. I visited these sites to find out who I needed to talk to about the training that I was doing.When I found out who that person was, I called and asked for an appointment. In person, I told them about WRAP. They set up 3 one-day WRAP overviews for all of the directors and managers to attend. 98% of the people who came “bought in” when they heard how empowering it could be and how inexpensive it was compared to other trainings they were providing. I used the research data, my own experience and the stories that I had heard along the way in my presentation. They asked me if they could contact some of the people I mentioned and I assured them that they could. I told them that if they brought WRAP in over the next 3 years, I could have enough people running groups so that I could “phase out” and those who are working in the county could continue implementing and overseeing WRAP. They would have their own people doing the work and the work would be sustainable over time. It took a lot of courage, persistence, research and time to get to the point of signing a contract for 3 years. Now we have people in every phase of the program, some that have just taken the five day training, those who took the five day training last year and who are running groups.They also have three Advanced Level Facilitators who are working closely with me to eventually oversee the process and assure that WRAP will continues to grow in this community. by Nanette Larson, head of the Office of Consumer Affairs in Illinois. Using a variety of strategies, approaches and interventions, each of which were designed both to enhance the recovery knowledge base among consumers and providers and to increase the number of qualified facilitators throughout the state, the Illinois WRAP program, “Wrappin ‘N Wrollin in Illinois,” has successfully developed and expanded throughout the entire state. Since its inception in 2002, our WRAP Facilitator’s Training has been held all over Illinois, twice each year, with twenty newly trained facilitators completing each 40-hour course.Continuing Education and Support is then provided for certified facilitators through various mechanisms, including WRAP Refreshers which are held quarterly in each of our state’s Regions. Many aspects of Mental Health Recovery Education and WRAP have been crucial and foundational to the ongoing process of creating a transformed mental health system in Illinois. For example, in 2008, our State undertook a thorough revision of the state Medicaid Rule which governs the billing process for all publicly funded mental health services. Throughout this revision, the language written into the rule for key services, such as Community Support (Group or Individual) and Psychosocial Rehabilitation, was specifically designed to reflect increased opportunities for agencies to bill for services and supports which are relevant to major elements of mental health recovery education and WRAP. Additionally, similar considerations were made in developing the language in the contract between the State and the provider agencies. Lastly, the Administrative Services Organization which was contracted to work with the State in the implementation of fee-for-service billing system, was also required to provide administrative support in the implementation of significant recovery initiatives, including WRAP.It has been through these strategies, approaches and initiatives that the transformation of the mental health system has begun. Founded in a belief that a truly recovery-oriented service system, facilitated in its development by authentic consumer leadership, offers the greatest potential for enhancing the recovery of the persons it serves. By Carol Bailey-Floyd describing her work on this research project. After I had been involved with WRAP for quite a few years, I had the opportunity to be the Project Coordinator for the University of Illinois at Chicago in the WRAP Research Study here in Ohio. Ohio was chosen because there were quite a lot of WRAP facilitators around the state. There were six studies involved, with three WRAP facilitators at each site, and 5 eight week series. It was an exciting challenge to recruit and train facilitators, and to oversee all the operations of the study. Many organizations around the state cooperated to make this study possible. They also had a chance to see the positive results firsthand as participants developed their WRAP. As a result of that study, WRAP is now an evidenced based model. WRAP workshops and facilitator trainings continue to be held in Ohio, sometimes with the help of the Ohio Empowerment Coalition. There was initial skepticism about whether or not West Virginia’s Office of Behavioral Health Services (now the Bureau of Behavioral Health and Health Facilities) would fund Wellness Recovery Action Planning. This self-determining approach for managing one’s challenges with mental illness was proposed by the state’s consumer advocacy network – the West Virginia Mental Health Consumers Association (WVMHCA) – in an effort to establish community-based peer programming, thereby helping to change the system. Recovery was a relatively new concept to the state authority; but not so to the people whose own life experiences had shown it was possible. At the start of the new century, West Virginia was seeking innovative ideas and so the State provided a seed grant for WRAP. In what proved to be a giant step, the consumers’ association sent letters to forty people across the state inviting them to be part of this new initiative. A follow-up meeting was held to explain the key concepts of wellness and recovery and to develop buy-in for the project. Twenty-four people, eager to be change agents, were in attendance at West Virginia’s first WRAP facilitator’s training. Attendees agreed to abide by the principles outlined and to facilitate their first WRAP group within the how they work for and alongside people who are facing life’s difficulties. Kathy Muscari (currently the Executive Director of WVMHCA) and Sherry Jenkins Tucker (now the Executive Director of Georgia’s Consumer Network) attended that first group and at the time were fairly new to the concept of using peers as supports. It changed their lives. Over a decade later, these two women are Advanced WRAP Facilitators and national leaders in the recovery movement, helping to create change in lives, systems, and communities. Additional attendees have gone on to present WRAP-related topics at conferences, faith-based groups, stakeholder meetings, and so forth. Several of these WRAP facilitators became involved in national technical assistance through the federally funded CONTAC (Consumer Organization and Networking Technical Assistance Center) project, taking WRAP to other states and countries. Since its start, West Virginia has held scores of WRAP groups and trained dozens of WRAP facilitators. This includes one of the first WRAP for Kids efforts and several Veterans’ groups. The statement “WRAP saved my life” is not uncommon and knowing this to be true has made Wellness Recovery Action Planningan extremely worthwhile investment for this rural state and beyond. 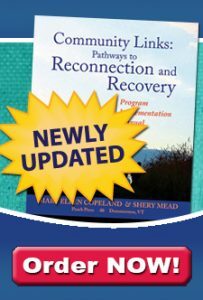 For more information on Evidence Based Practice Program Models, contact the Copeland Center at info@copelandcenter.com or 802-254-5335.